He's been on the lam since escaping federal prison in 2001. As Forbes senior editor Luisa Kroll told The Times of London: "He is not available for interviews, but his financial situation is doing quite well." But while he's not the first narco-kingpin to make the list (that dubious honor went to Colombian cocaine czar Pablo Escobar in 1989), Guzman's inclusion has rankled more than a few readers. As one commenter wrote on Forbes.com: "Since you have started glorifying drug lords and letting younger people see them as 'Billionaires,' this will be my last article."  Born on April 4, 1957, to a poor family in the rural town of La Tuna Badiraguato, his abusive father kicked him out of the house as a child. He's poorly educated, and reportedly resorted to using a ghostwriter to compose love letters to a mistress.  Began his career in the drug trade as an apprentice of "El Padrino" (Godfather) Miguel Angel Felix Gallardo, who once headed Mexico's most powerful drug cartel. 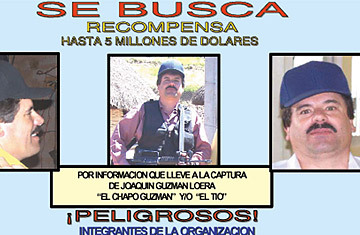 Guzman founded his own cartel in 1980, quickly establishing posts in 17 Mexican states. Sinaloa, his organization, takes its name from a Mexican state along the Pacific coast long known as a hotbed for drug trafficking. After Gallardo's arrest in 1989, Guzman inherited some of his territory.  Established notorious groups of henchmen, known as "Los Chachos," "Los Negros," "Los Texas," and "Los Lobos," which are suspected of committing more than 1,000 murders across Mexico, including the killing of cocaine rival Rodolfo Carrillo Fuentes of the Juarez Cartel.  Arrested in Mexico in 1993 for murder and drug charges following the accidental shooting death of Mexican Bishop Juan Jesus Posadas Ocampo in Guadalajara, killed by a competing cartel who mistook Ocampo for Guzman. Convicted and sentenced to 7 years for conspiracy, bribery and "health crimes," according to the BBC. While incarcerated, he paid prison officials to arrange conjugal visits and business meetings to maintain control of his empire.  Indicted in San Diego in 1995 for money laundering and conspiracy to import tons of cocaine. His more creative means of transport included transferring the powder inside fire extinguishers and cans labeled CHILI PEPPERS.  Escaped from the Puente Grande prison in Jalisco, Mexico in 2001, by bribing guards to smuggle him outside via a laundry truck; a federal investigation later led to the arrest of 71 prison officials. Puente Grande (Big Bridge) has since been mockingly rechristened the Puerta Grande" (Big Door) prison. Guzman once bragged that he spends $5 million a month on bribes to law enforcement officers.  Suspected of helping Mexican and Colombian drug traffickers launder as much as $20 billion in wholesale profits during his 8 years on the run.  Has become a popular subject of "Narcocorridos,"  pop songs about drug traffickers  and has gained an almost mythical status in Mexico, where he has been compared to Elvis and Osama bin Laden. One song, by Los Buitres (The Vultures), describes his life as a fugitive: "He sleeps at times in homes/ At times in tents/ Radio and rifle at the foot/ Of the bed/ Sometimes his roof is a cave/ Guzman does seem to be everywhere."  Rumored to have entered a restaurant in Culiacan in 2007 with a posse of 10 bodyguards who promptly confiscated every single patron's cellphone so he could safely eat his favorite meal  steak  without fear of an ambush. Upon leaving, Guzman paid for everyone's meal, and each cellphone was returned to its proper owner.  Reportedly married his third wife, Emma, in 2007 on the day of her 18th birthday in a wedding attended by hundreds of people, including local politicians and police.  Turf wars in May 2008 led to the shooting death of his son, Edgar, who was gunned down by rival traffickers outside of a shopping mall just a month after being released from prison. Currently battling two rival groups  the Juarez Cartel and the Beltran Leyva brothers, who had served as long-trusted aides until they severed ties with Guzman in early 2008.  Nearly captured in a Nov. 2005 raid at his rural stronghold in the western Sierra Madre, when Mexican police recognized his voice on a wiretap. But he fled the ranch before 200 army paratroopers had arrived. "He is very agile and, of the kingpins, is the one who moves around the least." "He remains fairly safe in Mexico because of his influence and his ability to corrupt." "He is the last of the Mohicans. All of the other big cartels have been decapitated. That is why they want him so badly." "People see Chapo Guzman as the social bandit, as a Robin Hood. He fixes up the towns and puts lights in the cemetery. He is part of Sinaloan folklore."